Stag parties go one of two ways. They can end with a wonderful time had by all, or in…..humiliation. And let’s face it, the wild antics of a good hen or stag must be quite a sight for locals–even leading to a photography series commemorating wild stag and hen dos in Blackpool. To get you in the mood, we decided to put together a list of some of the wild stag parties of the 21st century! Our first stag victim, Ollie McAninch, was so injured by his stag party that he contracted shingles, a disease common to war veterans after extreme trauma. Mr McAninch’s friends (including his bride-to-be) kidnapped him and after keeping him in a moving car, bound and gagged, for two hours, forced him to ride a rusty bicycle ten miles to arrive at his stag party venue. No, we didn’t just make that up. In true lad spirit, McAninch swore to “come up with something spectacular” for “future vengeance”. Good luck, Ollie. We’re rooting for ya. Setting the hair on fire. Classic. A group of revelers were kicked off a flight bound for Majorca from Manchester in 2012 when it became apparent that one of the passengers’ hair had been set on fire. No more needs to be said. Hope they made it to Majorca eventually! Our next stag victim was so courageous that he risked his crown jewels just to make it through the rest of his party. Dan Littlejohn was playing paintball with his fellow stags when one of them shot him a bit below the belt. Immediately, his testicles began to swell up, doubling in size before his fiance insisted on driving him to the hospital the next day. It turned out that the errant paintball had injured an artery, causing internal bleeding that had settled in Dan’s testicles. Of the incident, Dan said, I was in so much agony they could have taken them both off if it stopped the pain”. It couldn’t have been that painful, Dan. Will There be a Boat? Let’s face it, the Welsh know how to have a party go wrong. 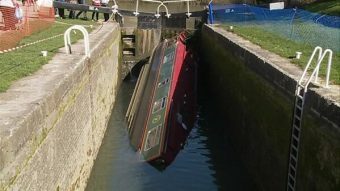 The above photo was captioned, “Welsh stag party’s capsized narrowboat will be lifted from a canal by crane today” by ITV Wales News. We can just make out the name of the boat on its side. It looks like maybe…HS Too Much Sangria. The Welsh trend continues with our final famous wild stag. Instead of being a victim though, this now-famous swimmer’s adventure was his idea. Whilst on a friend’s stag party, Arron Hughes decided to swim the Hoover Dam. The then 28-year old forklift driver didn’t know that over 250 people have died at that site. Bravo, Mr Hughes. To read the full story check out the Daily Post’s article on Mr Hughes’ stunt. We hope that our list of wild stag parties has gotten you in the mood for your own! Now’s your chance to join the tradition–you can plan your own stag or hen party with us. If you’re interested in learning more about our celebration packages, click here. Planning a Barcelona wedding? Check out our blog posts on Barcelona’s photographers, wedding venues, some proposal ideas, and more! Planning the stag party? We specialize in hen and stag parties in Barcelona, so be sure to look at our recommendations for hen and stag activities here and here. Anna Shoffner is a staff writer for Travel Bar, the Barcelona company that specializes in hen and stag weekends, offering Barcelona’s best tours and experiences. To see Travel Bar’s hen packages, tours, and activities, visit us at www.travelbar.com.